The mechanical stage is often an over-looked part of the microscope. As all parts of a microscope work together, the stage is a principle player when it comes to getting the specimen into view. Simply put, a stage is a platform located below the objective lenses. It has a hole in the center to allow the light source to illuminate the specimen. The specimen slide rests on the stage, and is usually held in place by clips. There are mainly two types of stages that users will come across: the simple stage and the mechanical stage. The simple stage has clips that will keep the slide in place. If the viewer wants to look at a different part of the slide, they must move it manually. 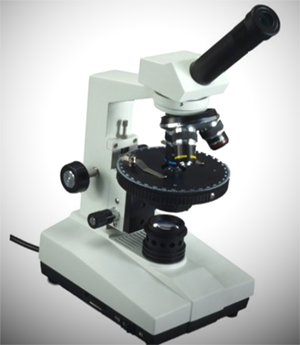 A microscope mechanical stage makes this task much easier. The mechanical stage has two knobs that move the specimen into the desired field of view by moving the stage itself. The translational knobs for the mechanical stage work both the X and Y-axis. With these knobs, one can use the mechanical stage to examine the specimen without losing their focus. This is a big advantage over the old simple stage, as users can keep their eyes on what they are moving. This comes in handy when examining specimens that are alive and on the move. The controls for moving the stage are often oriented to meet the needs of its users. Right-handed microscopes will have the stage controls on the right. Likewise, the stage controls will be found on the left for left-handed users. The X-axis control moves the specimen right and left. The Y-axis control moves the specimen slide back and forth. Some stages have locater marks on them to allow the user to note the position of something interesting. These stages are made to work smoothly and withstand the trials of use. Most are made from iron or aluminum. The translation mechanisms, or knobs, are typically a rack and pinion design. While this may sound like you're driving a Porsche, all it means is that the rotational motion of the knobs is converted into the linear motion of the stage moving on the X-Y axis. These knobs are typically made from aluminum or brass. Some models use synthetic polymers for the gears instead of metal. These don’t hold up as well as their metal brethren, as the knobs tend to wear out much faster. Any mechanical stage with synthetic gears needs to be cleaned, lubricated, and adjusted much more often. The surface of this type of stage also receives special treatment in the form of a non-reflective ceramic coating. This coating protects it from marks or scratches, yet is also dull enough to keep stray light from shining into the objective lenses and altering the view. We've discussed the simple stage, as well as the coveted mechanical variety. Yet you may be surprised to learn that there are other types of stages as well. Each has it's own unique design and purpose. For more detailed info on how certain types of stages work, see the Molecular Expressions stage page. Circular Stage - Just what it sounds like, this type of stage is a circle that rotates 360 degrees. This design allows you to easily rotate the sample, giving greater versatility and control to the viewer. A circular stage may be a simple setup that you have to move manually, or it may have attached knobs. Both options exist. If you're worried that a circular stage could lead to an accidental "Wheel of Fortune" style spinning of your specimen then take heart, they come with a locking mechanism that allows you to lock it into place. 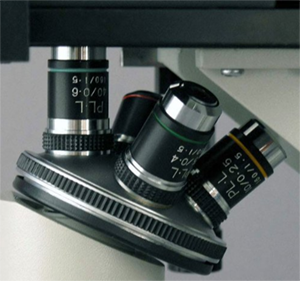 While not uncommon, you probably won't see a circular stage on the average microscope. 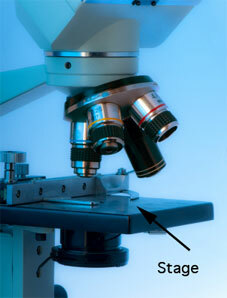 They're mainly used with polarized light microscopes and by those who practice microphotography. Inverted Stage - This type of stage works with an inverted microscope. On an inverted model, the light source and condenser are on the top and the objective lenses are on the bottom pointing up. These are used when you need to observe something under conditions more natural than just a slide, such as organisms in a liquid solution. Inverted stages are similar to a basic mechanical design, yet they have a larger opening in the middle. This hole allows you to view more of the sample (say a flask or mineral deposit), as the lenses are underneath the stage pointing up. The larger the opening, the more sample surface area you can see. Universal Stage - A universal stage resembles something out of a science fiction story. 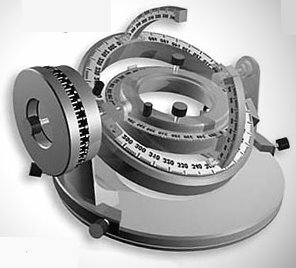 With it's intricate design of concentric and graduated rings, you can rotate and tilt the sample without too much fuss. This allows you to see structural details (such as cleavage and crystallographic orientation) that you couldn't see with a normal, flat stage. Universal stages are used with very thin specimens, and more modern microbeam instruments are making the need for them obsolete. Unless you're doing something like petrographic analysis, you probably won't run into one. Others - There are many other types of stages as well, from specialized ones custom-made for geologists to micromanipulators used to examine tissue cultures. 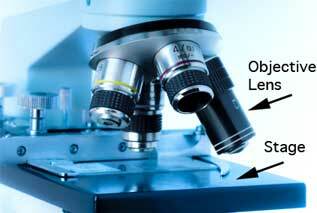 The microscope stage can be modified in a myriad of ways depending on the user's needs. Stages give the user an excellent place to put their specimens, and the mechanical stage took this feature to a higher level. It lets you examine your specimen without worrying about missing something really amazing!